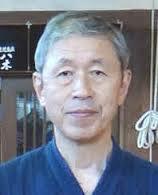 I spent this weekend at a seminar which finished with a grading examination. One of the candidates who failed asked for feedback and when I explained that the reason was failure to actively strike their opponent, I was told that it was the fault of my co-instructor who had advised that strikes should not be heavy. The candidate had responded to this advice by just reaching forward with the shinai as their opponent came towards them. I did my best to explain that there was probably some misunderstanding and what my colleague had meant was that they should not make heavy downward strikes but that the feeling should be one of going forward. Of course this did not mean that the hit should not be sharp. In my experience this is a common misunderstanding. We should still strike downwards but our body should move straight ahead. In short you can’t get ippon without hitting. It is not surprising that people get muddled on this point. In kendo we talk about oshigiri or push cutting, but to do this we have to deliver the datotsu bu of the shinai to the target area before we continue to cut forward with our body movement. To do this you have to learn to relax so that you can deliver a downward strike whilst pushing forward from your left foot. You can then make a sharp strike using your shoulders, elbows and wrists, whilst at the same time accelerating forward using our feet and hips and as we discussed last week, the force of our kiai. This type of confusion is common in our kendo careers when we tend to swing backwards and forwards from one extreme to another. We are told to make our big strikes smaller by one teacher and the next sensei tells us to make our small cuts bigger. We are advised to attack less frequently and then told to increase our work rate. Incredibly most of this advice will be relevant, but it is based on what the advising sensei sees on the day. There is some good news, in my experience this conflicting information starts to slow down as you develop your kendo. There is of course a difference in the approach of various instructors and as the saying goes “there are many paths to the top of the mountain”. When you attend seminars or visit dojo, the advice you may receive is based on what the teacher sees on the day. Of course kendo reigi dictates an answer of “yes thank you” rather than a discussion of what the last guy said. However it makes sense to take the new information away with you and reflect on how it will affect your kendo before incorporating it into your keiko. Men attack – how far back should you bring the shinai? 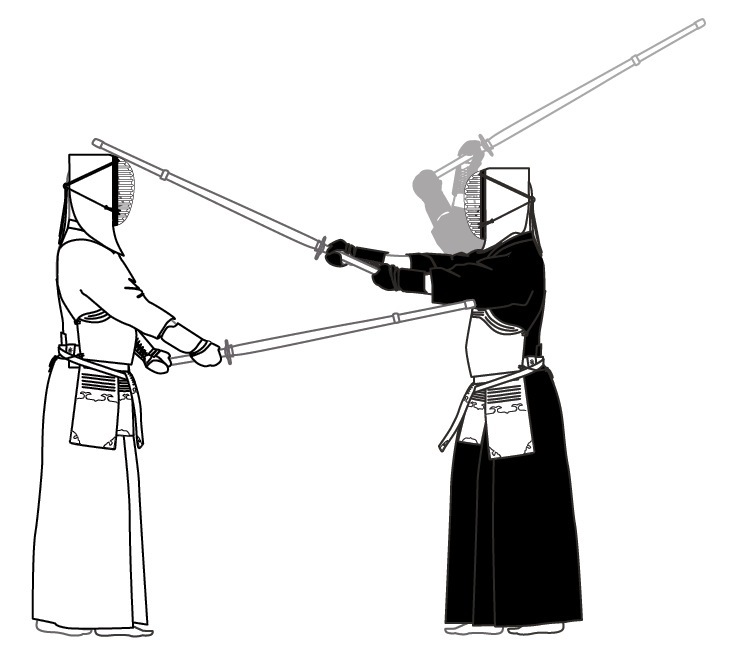 There has always been a debate in kendo about how far back your hands should go in the back-swing preceding a men strike. Some sensei will tell you that the shinai should stop at a 45 degree angle with the left hand held just above the mengane, others will advise you to bring the left hand back in line with the back of your men. Less frequently in waza geiko and jigeiko, but certainly in suburi there is a school of thought that says the hands should go to the back of your neck and that your shinai should hit your buttocks before you bring it forward. You will also probably have had varied instruction on the ideal shape of the cut and path that the shinai should travel. Different schools of thought include pushing the point forward throughout the backswing and cut, keeping your left hand at the same distance from all parts of the body as you raise the shinai, bringing the point back so that the shinai is horizontal when above your head and the list goes on. 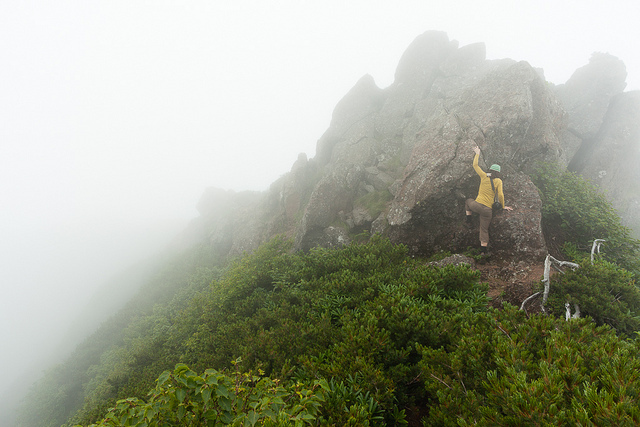 To quote the Japanese Proverb, “There are many paths to the top of the mountain”. 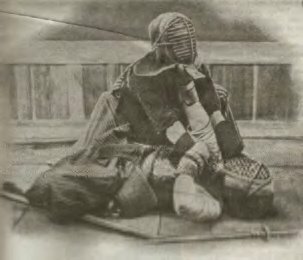 Most kendo teachers would agree that theirs is not the only way to hit men, but it is a way of making their students use their shoulders, elbows and wrists when doing so. The key point is to teach students to relax their arms and push up with the left hand, using all three joints as they do so. The right hand then follows using minimal force until it’s time to make tenouchi. It is not essential to make big cuts in kendo, but until you can do so correctly, it is unlikely that you will be successful making small strikes. If you ask a raw beginner to make a small attack to kote, where the point of the shinai moves only a few centimetres, he or she will probably do so by using the left hand as a pivot and make the strike with the power of their right hand. If when they do this you talk about using the power of the left hand, it would be very difficult to put into effect. On the other hand, by asking them to bring their hands up to above or behind their heads, you teach them to cut correctly. Once they can do this then the next challenge is to reduce the size of the cut, replacing the momentum of a big swing with sharp tenouchi. To mix a number of metaphors – The road to kendo satori is paved with conflicting advice. We have to choose, or more likely we are told, either to put our tenugui inside or outside our men before or after practice, to make our suburi bigger or smaller and to use or not use tai-atari as part of kirikaeshi. The kirikaeshi question is an interesting one. For such a standardised, widely practised exercise, there is considerable variation between the ways it is taught in different dojo. Distance, speed and timing tend to vary, there are two schools of thought as to where the break in continuous breathing should be, but the key point of contention is whether or not to make tai-atari after the shomen strike, before starting on the yoko-men sequence. If you are kendo student the chances are that you will have no say in how you do the drill. The way you go about it will be dictated by your instructor’s preference; having said that, a thoughtful instructor will take your experience and skill level into account. Tai-atari in kirikaeshi replicates the situation in keiko or shiai when the opponent remains in front of you after your first attack. You need to move into tsubazeriai and push him backward and attack again either with a hikibana or hikiwaza technique. So it’s a useful thing to practice. On the other hand unless your posture is developed to a level where you can constantly keep your hips and centre engaged while relaxing your shoulders, making tai-atari immediately after a men attack causes you to lean forward and use your shoulders. This makes you unstable and therefore unable to move quickly to the next technique. What I am trying to say in a rather long-winded way, is that if you can do tai-atari correctly, then do it. This means that your posture should be completely upright but when you make contact with your opponents’ hands you should lower your hips and push down lightly, not relying on upper body strength. If on the other hand this is new to you, then the best way forward is not to push, but to remain in the position in which you hit men as your partner steps back into the correct distance for you to start the yoko-men sequence. In some dojo this is practised with an emphasis on motodachi creating as much distance as possible – to encourage kakarite to stretch to reach the target. My personal view is that this no-touch approach will serve most people well up to 3rd dan level, but again, your instructor should know best. Often when I am teaching or watching others teach kendo, I find that waza drills take considerably longer than the time allocated to them. This is because I and most other instructors like to break techniques down to their constituent parts and build up to the finished technique. I am sure that you know the sort of thing I mean. For instance, men suriage men; where kakarite starts by attacking men at close distance, then motodachi responds by sliding his shinai up against the down stroke and when he gets that right he moves on to striking men in response. When it’s all working, both parties build distance and speed to approximate a real-time opportunity. Well that is the theory anyway. What invariably happens is that at the most basic stage, the instructor notices fundamental flaws with posture, or footwork, or grip and then tries to correct that before moving on. This is of course a far bigger task than anticipated and sometimes, when the class has a high proportion of less experienced kenshi; it never gets out of the correcting basics stage. It could of course be argued that this happens because the teacher is asking students to practice new techniques before they are ready to try them, but as most kendo classes consist of mixed abilities, should we aim to stimulate the more advanced student or keep it within the ability level of the newest? I personally am happy to practise the most basic techniques and can see the value of constantly repeating suburi and uchikomi drills for basic shikake men attacks, many instructors however are worried about losing students to boredom, if obvious progress is not confirmed by them learning more complex techniques. I would be interested in to hear your thoughts and have included a simple poll for you to tell me about your level of experience and the elements of training that you are most regularly involved in. I have been doing quite a lot of kendo reading lately and I really enjoy learning more about the cultural and historical aspects of kendo. I do however find it quite difficult to translate written descriptions of technique into physical movement. Even when reading instruction on techniques that I know well. Words on a page seem to have little relation to the required action. This may be because the writer has not made it quite clear or maybe it is a language translation issue. More likely, it is about the way I respond to written instruction. With that in mind I tried a cheap and cheerful VAK (Visual, Auditory, Kinesthetic) learning test, to find that I score highest on my preference for physical experience, followed by visual demonstration with explanation coming a poor third, so I suppose that the traditional kendo teaching model of “see it, do it” is an approach that suits me. On the other hand many other western kendoka take a far more analytical approach to learning and need detailed explanation of the mechanics of a technique. Whilst I find the text book description of movement difficult to follow, it is essential to understand the “riai” or purpose of each technique, but in my case, the ideal learning experience is to be shown the technique, be allowed to do it and then corrected when its wrong. Then, when I have mastered the basic movement, that’s when I start to look for a detailed explanation of riai, so that I can then apply the waza to the correct opportunity and timing. Very often this explanation may have come from a teacher or senior; although not necessarily when I needed it. I have had eureka moments when theory that was taught to me many years ago and which meant nothing then, finally became clear because I had at last understood the physical action that it related to. At other times, curiosity has prompted me to turn to books or the web to find the answer. This is when I instantly absorb information; when I want it badly enough to search for it. In terms of my own teaching style, I try to incorporate explanation with demonstration and then give lots of opportunity to practice the technique. Whether or not I get the mix right is questionable. Some students show immediate improvement, whilst others take much more time to learn what is being taught. Like many people who teach kendo, I am an amateur. I have had no formal teaching training. However, as a far more skilled educator put it, “the objective is not to teach, it is to help people learn”.